This musical snow globe features the 8th edition in our annual angel Series amidst a magical, ‘snowy’ scene. Winds up to play the tune “angels we have Heard on high”. on that Holy night in Bethlehem, Shepherds and angels alike rejoiced in the good news. Hearts will be lifted with a message of Christmas joy when they fill their home with the sounds and sights of a winged angel celebrating the miracle of our Savior’s birth. 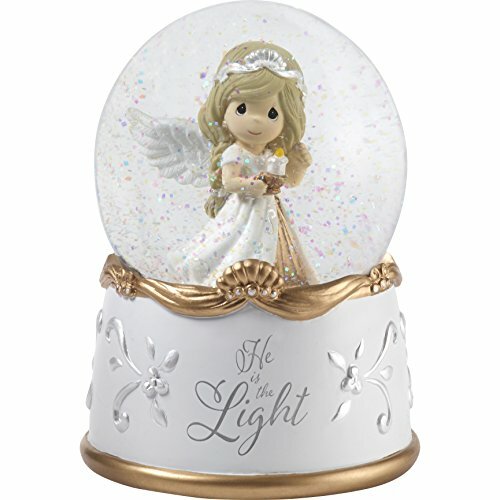 A thoughtful Christmas gift for teachers, family, friends, or anyone who enjoys collecting Precious Moments annual angel figurines, ornaments and snow globes. This 8th annual angel musical snow globe is crafted of cold-cast resin and glass and carefully hand-painted. Approximately 5.75 inches high.